"I was wrong." -- Norma McCorvey, 'Jane Roe' of Roe v. Wade, never could have imagined the outcome of her deception: 4,000 abortions a day since 1973. 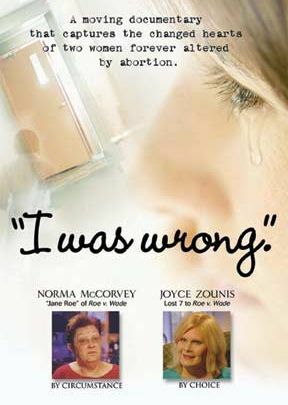 Norma never had an abortion, but her Supreme Court case brought abortion on demand to America. Darkness and disillusionment plagued her life with baby parts, alcohol, drugs, and suicidal attempts. The power of prayer plus the loving actions of a little girl and others drove Norma from working in an abortion center into the arms of Jesus. "I was wrong." captures the changed hearts of these women restored by the redemptive forgiveness of Jesus Christ and brings a deeper understanding of how abortion strikes at the heart and soul of America. Distant Thunder (Special Edition) -- Things are not always as they seem... especially when entering the halls of a desperate mind in this gripping supernatural thriller. Struggling to keep her fragile sanity from unraveling, Prosecutor Ann Brown is offered a murder case that will challenge everything she believes to be true. Uncertain at first whether to accept the assignment, a harrowing encounter with Defense Attorney Tom Condan convinces her to meet the challenge. The deeper she investigates, reality and tormenting delusions collide as she encounters an evil force as unnerving as it is foreboding. In this award-winning movie, terrifying secrets are exposed, and you'll discover the shocking twist which reveals the chilling and unforeseeable truth.